These statistics are generated based on the current listing's property type and located in Mun of Coldstream. Average values are derived using median calculations. Named by National Geographic as “One of the Top 10 Most Beautiful Lakes,” Kalamalka is appropriately known as the lake with many colours. With unobstructed 180-degree views, and an incredible 2.45-acres of sprawling land adjacent to Provincial Park, this retreat is one of the largest in the area. 254 feet of lakeshore accompany the expansive lot and quiet location in creating a level of privacy that is unique to the area. Custom designed for full appreciation of the surroundings, the lakeside landscape includes terraced lawns for sunbathing, multiple decks, and a beach. The property itself includes two gourmet kitchens with state-of-the-art appliances and top of the line finishes, as well as multiple suites and entertaining areas. Entirely open-concept with vaulted ceilings, the home lends itself naturally to larger gatherings, making it an ideal location for business and personal retreat. Like nothing else in the area, this waterfront estate is an incredible opportunity for the discerning buyer looking for something remarkable. Open-concept layout with vaulted ceilings and abundant windows. Two gourmet kitchens with top of the line appliances and finishes. Expansive dining and bar area for large-scale entertaining. Master suite with in-suite Jacuzzi tub, private deck access, and ensuite bathroom. Multiple bedroom suites split between main floor and lower level. Private gym with views to inspire. 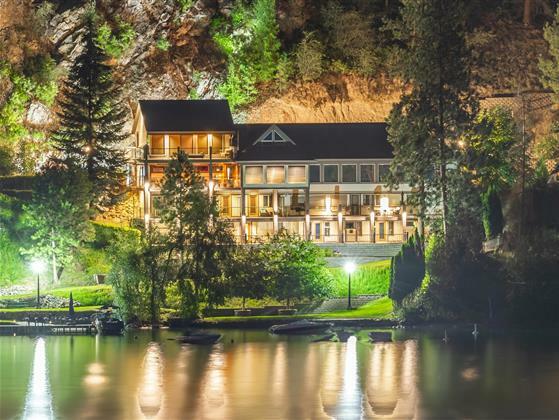 One of the largest properties privately owned on Kalamalka Lake at 2.45-acres. 254 feet of private and secluded lake frontage. An incredible level of privacy for the area. 180 degrees of unobstructed Lake views. The property is comprised of two separate titles, located adjacent to Provincial Park. Beach area, and terraced lawns on lakeside. Expansive front parking area with space for a significant number of vehicles. Fabulous garage with multiple vehicle parking. Rare size and location on Kalamalka Lake, voted one of the most beautiful by National Geographic. Two separate titles located directly adjacent to Provincial Park. 2.45 acres and 254 feet of lake frontage, one of the largest and most significant private properties on Kalamalka Lake. For a private viewing of this Kalamalka Lakeside estate, call the Salt Fowler Team today at 250-549-SALT (7258) and "Just Add Salt"!